Feeling the Summer coming? Me too! My offering for this month at the PFATT Marketplace is all about Summer! 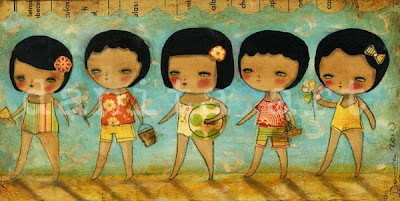 First, "Summer Parade" a 6x12 inches collage on wood with beautiful colors of the beach. These cute little boys and girls are ready for a day of fun! 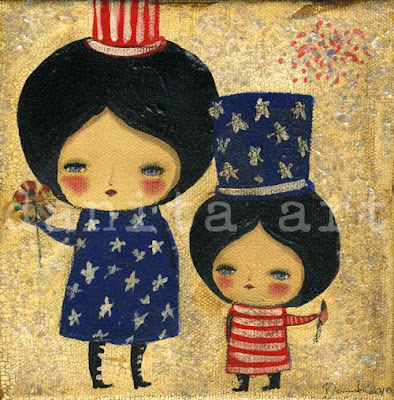 And "4th of July", a small 6x6 inches on canvas with festive colors and vintage mica for extra sparkle. AHH, summer! These are so cute.....makes me want to go to the beach! The dolls are also great. Love the way you make things!